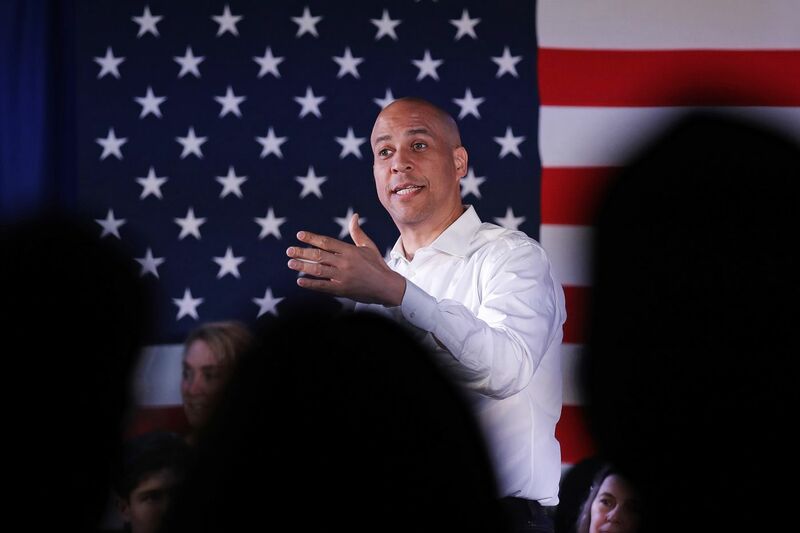 U.S. Sen. Cory Booker (D., N.J.), seen here at a campaign stop in Portsmouth, N.H. on Feb. 16, reintroduced a sweeping bill Thursday to legalize marijuana nationwide and expunge the records of people convicted of marijuana-related offenses. More than 25 years after Bill Clinton tried to downplay his marijuana use, Sen. Cory Booker (D., N.J.) is calling to legalize the drug nationwide even as he seeks to become the next president. Booker reintroduced a bill Thursday morning to make the drug legal, expunge the criminal records of those in jail for marijuana offenses, and create a “community reinvestment fund” for job training, community service centers, and other programs in areas the sponsors say have been unfairly harmed by the so-called War on Drugs. Many of Booker’s rivals seem to agree. Sens. Elizabeth Warren, Kamala Harris, Bernie Sanders, and Kirsten Gillibrand, all competing for the Democratic presidential nomination, cosponsored the proposal. Legalization has become mainstream in a party base growing more liberal. The bill isn’t new — Booker proposed it in 2017 — and it’s unlikely to go anywhere soon. What’s different is that the senator is bringing it back as one of the first major policy proposals since he launched his campaign for president, signaling that he believes the political terrain is much different not only from Clinton’s days as a candidate, but even from Hillary Clinton’s run in 2016, when she never went so far as to call for national legalization. The bill is in line with Booker’s early campaign focus. While his message has centered on healing political and cultural divides, his most prominent policy theme has been social justice and the mistreatment of minorities. He cited those same issues Thursday in a Facebook Live broadcast unveiling the bill. “This is about dealing with systemic racism that’s baked in our system,” Booker said in the video. He pointed to the disparate consequences for some people who use or sell drugs, such as his Stanford University classmates, and the punishments faced by others, such as the low-income Newark, N.J. residents he now lives among. LIVE: Just reintroduced the Marijuana Justice Act! This bill will: – legalize marijuana on the federal level – expunge records for federal marijuana use & possession – reinvest in communities harmed by the war on drugs Listen in on the conversation in my office with my House partners on this bill – Reps. Barbara Lee and Ro Khanna – talking about why this is so important to ending the failed War on Drugs. A 2015 report from the Sentencing Project, citing American Civil Liberties Union statistics, found that black people use marijuana at 1.3 times the rate of white people, but are arrested for possession 3.7 times more frequently — a figure Booker has cited in early campaign stops. Booker has long focused on such issues. His signature legislative achievement is a bipartisan criminal justice reform he helped to craft, aiming to reduce disparities in prison sentences handed to minorities. Past presidential candidates in both parties — from Obama and John Kerry to Bush and Ted Cruz — have admitted to using marijuana. But none has gone as far in calling for legalizing the drug. Marijuana legalization advocates have hailed Booker’s bill as the most sweeping proposal ever introduced. Public opinion and political trends appear to support Booker’s approach. Ten states have legalized marijuana, and 33 allow use for medical reasons. Also, 66 percent of Americans support legalization, the largest share ever, according to an October Gallup poll. Vast majorities of Democrats (75 percent) and independents (71 percent) supported legalization in that survey. A smaller majority of Republicans (53 percent) backed the idea.